I read. A lot. It is one of my favorite activities. There are many books I enjoy. But very few that I would whole-heartedly encourage you to read. But this is one book I really found to be worthwhile and helpful. It was also a fun and easy read! I truly enjoyed this book. 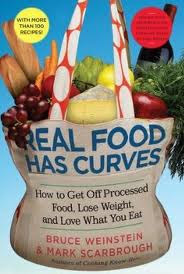 Real Food Has Curves: How to Get Off Processed Food, Lose Weight, and Love What You Eat by Bruce Weinstein & Mark Scarbrough. This book is very readable, with examples from the lives of the authors and fun tidbits interspersed with all of the helpful advice. It includes useful charts showing what is real food, almost real food, barely real food, and not real food. They also have lots of wonderful advice on how to cook and what to cook, including 100+ recipes--many which looked good enough for me to mark and try. There are no pictures here. Simply good, solid advice on how to make the switch from a processed diet to a real food diet and why it is important to do so. I highly recommend this book. I just finished it today and am anxious to try some of the recipes.